There is a pond at the end of the lane where I live. Once, my friend Anchal and I, in our effort to improve waste management, gathered up the neighbourhood children to clean up the garbage accumulated in the pond. They put on gloves and removed several kilograms of plastic, thermocol, broken glass, etc. Anchal, not only a waste management enthusiast but also a trekker and photographer of birds and butterflies, was suddenly excited. She had spotted Flapshell Turtles in the pond! Though Flapshells are common across India, to see some right here in our neighbourhood in Pune was a treat. Soon the children were quietly observing the drama before their eyes. A shikra sat on a high branch nearby, keeping a keen eye out for prey. A kingfisher perched on a tree at the other edge. And on an electrical wire sat a row of Green Bee-eaters, some of which flew out occasionally in a rapid sortie and darted back to the wire, usually with a fly or bee in the beak. Some purple moorhens disappeared into the reeds. And frogs could be seen peeping out of the water and then again diving under. What other treasures had the garbage been hiding? The garbage clean-up activity became a nature experience. 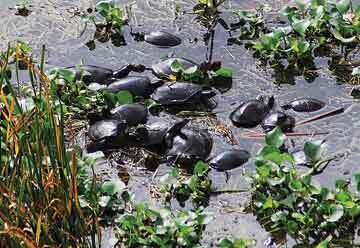 Later, the children put up a sign saying ‘Gulmohur Park Flapshell Turtle Sanctuary’. The sign faded with time, and the ink finally washed away in the rain and the children grew up and moved on. But I like to think that they had a learning experience to remember. For me at least, the place changed from being a derelict, mosquito-ridden, disease-spreading bit of swamp to a mysterious, living emerald jewel gleaming in the sunlight, a beautiful secret place in the neighbourhood. School children and young people in cities have a very important role related to urban nature. Firstly, they have to learn about the biodiversity around them (such as lakes, rivers, small or large natural and semi-natural patches of vegetation, etc. ), how we make use of such natural elements, their status, and how we currently manage them. Secondly, they have to find new ways of managing cities so that other species as well as human beings have a better life, in the context of global climate change. Students have to acquire the abilities or competences to undertake this learning and investigation. Teachers, of course, have individual preferences for the methods that may be appropriate in this context. Biodiversity monitoring using quadrat studies, species identification, bird watching, field trips, projects such as creating herbal gardens, plantation, are especially popular. Such nature experiences can form the foundation for life-long appreciation of and respect for nature. Now over 50 per cent of the human species lives in urban areas worldwide, and in India, already over 31 per cent. Teachers therefore must build on the values of nature appreciation and go beyond these to help students explore practical ways to reduce our impact. Box 2 provides a list of ecosystem services in the urban context. It is thought that by making clear the value of nature’s benefits to human society, these values can be considered in development planning. Students should be able to appreciate the ‘systemic nature’ of the interactions between ecosystems and humans. We may re-design cities and the patterns of use of biodiversity according to our current understanding. However, we must keep in mind that human society and its knowledge, technologies, patterns of use of resources keep changing, and in recent times, these are changing quite rapidly. Similarly, we must keep in mind that biodiversity is also evolving and changing. Climate change is a major factor that is driving changes in the nature of ecosystems and interactions between species, for example due to changed monsoon patterns. Changes in seasons, in the time of flowering of plants, time of arrival of migratory birds, or numbers of certain types of insects present in a specific season are some of the visible changes people are already observing. Schools could consider being involved in SeasonWatch (http://www.seasonwatch.in. ), which is a citizen volunteer network that monitors the seasons as revealed by trees. Participants help to document the timing of flowering, fruiting, and leaf-flush of roughly 100 tree species. The collective data can show how this timing may be changing as the climate changes. SeasonWatch is run by the Citizen Science Programme at the National Centre for Biological Sciences, Bengaluru. Try Activity: Impacting Nature as a way to show how the activities of human society impact habitats and species. What is the role of human knowledge, policies, ways of functioning, designing or implementing infrastructure, etc? Can these be changed to benefit habitats and species? The concept of ‘Green Infrastructure’ is one direction for practical ways of enhancing ecosystem services in the city. Rivers and streams, soil, grasslands and forests are natural ‘green infrastructure’ or assets that make cities livable. Human-created wetlands, habitats for particular species, assistance in migration or breeding, re-forestation or re-vegetation, green roofs or green walls are human-made green infrastructure. Where possible, cities could shift to green infrastructure to provide the services citizens need. This can be for sewage treatment through managed wetlands, composting organic waste, networks of green walkways for pedestrians and cyclists, urban agriculture as a source of food, income and recreation, green roofs for cooling buildings as well as for food and composting. Students could study the ways in which natural assets or human-created green infrastructure is contributing to quality of life of citizens in urban areas and take up action projects to create such assets. There is enormous creative thinking, experimentation and innovation to be done to reduce our impact on nature, and teachers and students can and must be part of it. A prize for the best response – what else could Anchal and I have done? Refer to the story ‘My Neighbourhood Pond’ at the beginning of the article. Anchal and I acted like nature educators, and I am sure we did a good job! But could we have used the opportunity for more than nature appreciation? What other aspects related to cities and biodiversity could we have discussed with the children? Write in with your ideas. The best three will win prizes! One way of studying and interacting with biodiversity is by using the ‘ecosystem benefits or services’ approach. Historically, many cities have evolved near rivers or water sources, using ecosystem services already available there. As cities have grown, the growing demand for space and resources has tended to degrade or destroy the ecosystems cities are dependent upon. Cities impact biodiversity and ecosystems, at the local and regional levels by directly drawing resources or by physical modifications (such as when creating infrastructure), as well as at the planetary level by drawing resources from distant lands, and generating emissions that contribute to climate change. Humans have consciously modified biodiversity in urban habitations by introducing and cultivating selected species, such as in parks and gardens, and pets. Urban areas may have higher biodiversity, due to increase in the types of habitats and niches, and introduced species than the surrounding natural and semi natural regions. Human-created habitats resemble certain types of natural habitats (for example buildings and bridges resemble rock faces or cliffs) and certain species have adapted to such human created habitats (such as swifts, swallows and blue rock pigeons). Urban environments typically have high air or water pollution levels, dry or arid conditions, heat islands, and species that are able to tolerate such conditions may persist or thrive in larger numbers in urban habitats. Humans can create their own habitats, infrastructure (such as through ‘green infrastructure’) and use resources in ways that benefit both other species and humans. Green infrastructure may be defined as an interconnected network of green or natural spaces that conserves natural ecosystem values and functions and provides associated benefits to human populations. Give examples to illustrate the sequences. Identify any activity in your own experience that impacts the environment and build up the rest of the sequence. Here is one flow sequence: People construct institutions that undertake activities that impact habitats that support species. Here is an example to illustrate this sequence: Students in a Pune school have formed an eco-club that undertakes garbage clean-ups to restore a wetland that supports migratory birds. Another example: The government created a policy that supplied cheap bamboo to paper factories in Uttara Kannada that led to over-extraction of bamboo in the district and depleted the local forest. 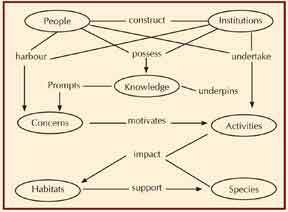 The diagram above shows that people impact habitats and species. Can you think of ways in which habitats and other species affect humans? Note: This activity is from ‘Environment and Development’ for Std XI, Maharashtra State Board of Secondary and Higher Secondary Education, 2012; the concept map template has been developed by Dr Madhav Gadgil for the NCERT Handbook on Environment Education. The Maharashtra textbook is based on the NCERT Handbook. Some cities in India are fortunate to have wildlife sanctuaries or national parks within the city limits or very close by. Try and match them. The author heads the urban programmes group at Centre for Environment Education, Pune. She is also involved in curriculum development and textbook writing for EE in Maharashtra. She can be reached at sanskriti.menon@ceeindia.org.